My San Antonio reports that Mitchell Lake Audubon Center on Saturday hosted a ceremony where seven Girl Scouts each received a Girl Scout Silver Award. 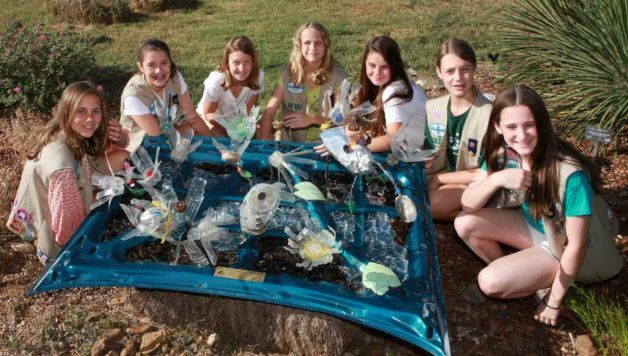 All seven girls were mentored by renowned local artist Katie Pell in creating a visual art exhibit, “Leave the Lake Cleaner than You Found It,” which also was unveiled Saturday at Mitchell Lake Audubon Center. The artwork was built entirely from trash collected by the scouts at Mitchell Lake Audubon Center, and will be used by the center as part of its extensive educational program for area students. The Girl Scout Silver Award represents a girl's accomplishments in Girl Scouting and her community as she grows and works to improve her life and the lives of others. The first four requirements of the Girl Scout Silver Award help girls build skills, explore careers, gain leadership skills, and make a commitment to self-improvement. Do you have any Girl Scout Silver Award stories?